You are here: Home > History > A Company, 22nd Inf. Regt., Nov. 16 - Dec., 3, 1944. Pfc. Harold Rush, squad leader, 1st plat. Pfc. John L. Page, squad ldr and later plat leader, 2d plat. Pfc. Fern L. Hartman, squad ldr. 2d plat. S/Sgt. John E. Smith, mortar section leader, wpns plat. Pfc. Elton K. Fisher, squad leader, 1st plat. Pfc. Arthur A. Bonaldo, squad leader and later plat. ldr., 1st plat. Pfc. Percival Coggins, Jr., company hq. A Company moved out in a column of platoons on B Company’s left flank, paralleling B’s advance northeast up a fire break extending toward (012383). The front was no more than twenty yards wide during the approach march, and the men advanced in column of twos, staggered 5-10 yards apart. They moved out at 1130, and at 1430 started to receive scattered sniper fire as they advanced along a ridge. 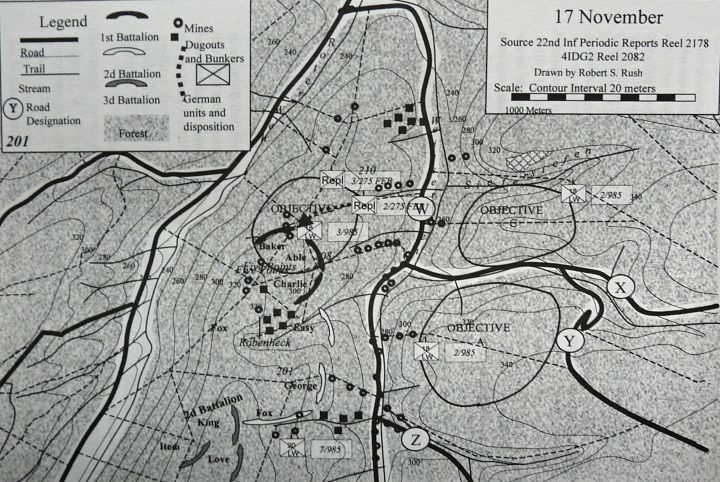 The enemy must have expected an advance through the ravines and draws, for that is where they dropped their first artillery and mortar concentrations; they soon showed, however, that they were also registered on the ridges because the company started to get casualties from shell-fire on the ridges along which they advanced. The light machine gun section of the weapons platoon was following the 2d platoon during the approach, and was hit the hardest by the enemy mortar and artillery, being almost wiped out. Turning to the right close to the objective, the 2d platoon led the way up a hill and passed through E Company, the reserve company of the 2d Battalion. 1000 yards from the line of departure, vicinity (008380), the 2d, 3d and weapons platoons started to dig in on the left of B Company. The 1st platoon was then given the mission of establishing contact between the 1st and 2d battalions, by tying the right flank of B Company to the left flank of E Company. When the 1st platoon started on this mission, there was a gap of about 600 yards between the two battalions, with E Company to the southeast of B. Lt. Bernasco swung his platoon around to the left flank of E Company and then started them back toward the northwest in an effort to find B’s right flank. He had his men spread out in platoon column with a 20-25 yard front, with two scouts 25-50 yards in the lead. As the column advanced, he started dropping a man off every 10-15 yards, but the platoon would not stretch far enough to reach B Company; it only reached 300 yards and there remained a 300 yard gap. S/Sgt. Frank Espino, S/Sgt. Elvie Ingram, and Pfc. Raymond Fraher then ventured out to patrol and find B Company. By this time it was already after dark and communication had been lost with A Company because, as the men said, “the SCR 536 is the sorriest excuse for communication in this terrain that Uncle Sam ever dreamed up.” On level terrain, this radio might carry several miles, but despite the fact that new batteries were put in daily, it was found that communication was immediately broken as soon as they crossed a hill or draw. The three-man patrol stumbled ahead in the dark and fifty yards out they tripped over several sleeping Germans. The patrol drew no fire, but it beat a strategic retreat and told Lt. Bernasco that they would go out again with blood in their eyes. On the second trip, they observed a 4-man enemy patrol advancing, allowed them to get within 25 yards, and then Pfc. Fraher from a covered position shot and killed a German officer. The patrol warned the 1st platoon’s left flank to be alert, and then ambushed another enemy patrol. This one was broken up when Sgt. Ingram fired an anti-tank grenade which hit the lead man of the patrol in the chest; two others fled. Repeated enemy patrols tried to penetrate but were all beaten off, even though the 1st platoon failed to establish contact between the 1st and 2d battalions. Documents were captured from the dead enemy, showing all the 2d battalion positions, and also plotting our mortar fires. About midnight 16-17 November, E Company supplied a squad of men which augmented the 1st platoon of A Company and went out again to clean out the enemy between the 1st and 2d battalions. This little task force started out in squad column and when a few shots were heard it formed a skirmish line with three squads abreast and the fourth about 25 yards in the rear. 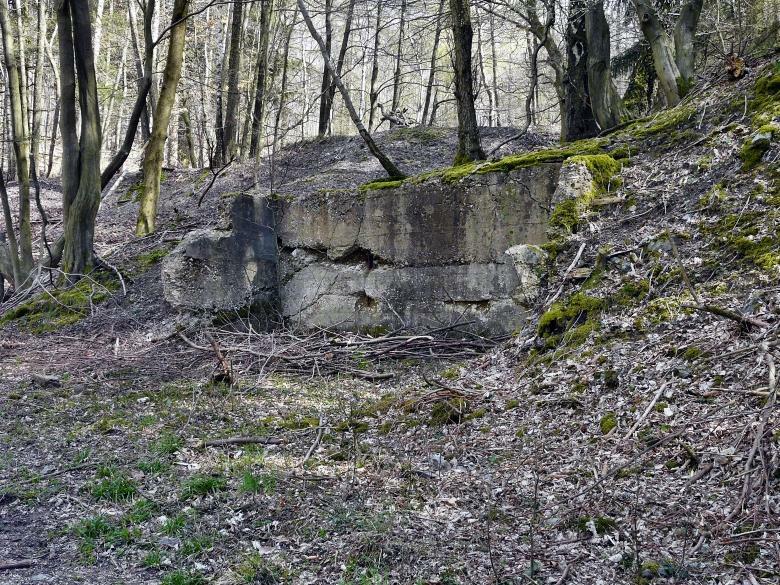 The E Company squad was on the left of the skirmish line; one man from this squad threw four grenades in rapid succession into a German entrenchment, and shortly thereafter four prisoners were taken. This strongpoint was defended by barbed wire, log-covered emplacements, and some trip wires which were not mined. No casualties were suffered. Meanwhile, the other platoons of A Company were digging in on the forward slope of a hill on the left flank of B Company. The company positions covered a 350-yard front, with three mortars set up 35-40 yards back and the machine guns defending the center and flanks. The next morning the company was due to jump off on B Company’s left flank, and they delayed until 1100 hoping that the 1st platoon would reappear. Part of the delay was also due to the extremely heavy shelling which caused a number of casualties, including the battalion commander. According to Lt. Warner, Capt. Clifford M. Henley, acting battalion commander, did yeoman work getting the attack coordinated and started under these circumstances. Having no radio contact with the companies, Capt. Henley went up and down the lines on foot, issuing orders to the leaders and urging the men forward. He stayed on the line with the assault companies until the attack was well under way. A Company kept a skirmish line during the advance, 300-400 yards wide; about 35-40 yards to the rear of the front elements, three light mortars were set up and one light machine gun fired on the right flank between A and B Companies while another machine gun fired from the same relative position in the center of the company. The left flank of the company was uncovered by friendly troops, but protected by a draw. Proceeding to the left/of (northwest) the firebreak up which B Company was advancing in a northeasterly direction, A Company met heavy artillery, mortar, heavy small-arms fire, mines and booby traps. The company suffered 1 killed and 23 wounded for the day. In the area of its objective, vic (005379), about six dugouts were encountered. These dugouts were about fifty yards apart, surrounded by communication trenches. They were covered over with several layers of logs and dirt. According to the men of A Company, these entrenchments constructed by the enemy always seemed to be drier than the hasty ones which our forces could construct during the short period of time which they spent on each day’s objective; they had sufficient logs and dirt to prevent seepage of rain and sleet. Communication trenches surrounded these dugouts. A machine gun manned by three or four men was in each dugout, and their capture involved advancing steadily and maintaining a fire superiority. A squad of men usually advanced in skirmish line on each of the dugouts, firing rapidly as they advanced. A final rush was made when the men had advanced at walking speed to within fifteen yards of the dugouts. The company started off in column of platoons, with the 1st platoon leading. A heavy barrage of mortar and artillery once again greeted the advance; tree bursts were particularly frequent, and the scrub pine was slashed and tangled across the path of advance. An artillery shell killed Lt. Donald H. McCracken, company executive who had just been promoted from his position as weapons platoon leader. Lt. McCracken’s old platoon sergeant, T/Sgt. Clement Schelsky, cracked completely upon receipt or the news; he was evacuated for combat exhaustion. As throughout the campaign, the leading platoon advanced with the fewest casualties from artillery and mortar fire. According to Pfc. Elton K. Fisher, “I’d rather lead with an assault platoon any day than wait and have to wade through all that shellfire which the support always got.” The 1st platoon made the quickest progress initially, advancing along the firebreak commencing at (015388) and proceeding in a northeasterly direction toward the small stream which cut across the battalion front in a general north-south direction close to the north-south road. Pfc. Alfred Van Camp fired rifle grenades with effectiveness along this firebreak, blowing off the head of one enemy and killing a second by concussion. After crossing the stream, the company took a new formation and advanced with three platoons abreast in order to keep contact and comb the woods more effectively. The men advanced about 5-7 yards apart, but even so contact was sometimes difficult. All radios were out and S/Sgt. Elvie Ingram went back to contact battalion and make sure that no resistance was being bypassed and that the supply lines would not be harassed. On the way back, Sgt. Ingram accounted for another German with his rifle grenade. Mortar and artillery fire increased in intensity after the platoons started out again from the stream. Contact was then broken between the 1st and 2d platoons, and the 2d platoon skirted to the right (south) of an area just north of the east-west firebreak, which was being heavily shelled. The east-west firebreak, which was the battalion axis of advance and the nominal boundary between the companies, was well covered by a machine gun which was firing from (028387) and had an excellent field of fire in a westerly direction; this machine gun was not knocked out on 18 November. Just before reaching their objective, in a draw, Capt. William Q. Surratt, the company commander, observed a group of five enemy to the northeast. Two were standing and three were sitting, looking away from Capt. Surratt. Putting his finger to his lips for silence, Capt. Surratt beckoned three headquarters men– Pfc. James Armstrong, Pfc. Aloysius H. Masensas and Pfc. Percival Coggins– to come close. He then said quietly and deliberately: “One, two, three, FIRE!” Capt. Surratt fired his .45 caliber pistol, Pfc. Armstrong fired his carbine, Pfc. Masensas fired his BAR, and Pfc. Coggins chimed in with his M1. The five Germans hurriedly started to run, but all were mowed down. Since they were running in an area which was downhill from Capt. Surratt and his crew, and the area was clear of trees, they made excellent targets. At dusk, Just after starting to dig in on the objective, five prisoners were captured. The 1st platoon saw them approaching, and they were fired on from a distance of about 150 yards; they then gave themselves up. After reaching the objective, steps were taken to prepare defensive fires in front of the company. The cannon company, 44th Field artillery battalion, 60mm mortars, and 81mm mortars were zeroed in in front of the lines. There was enough time to complete the registration while the company was in position on the 19th, and several arcs of fire were planned for in front of the company. The artillery was placed far out and then it crept toward our lines, taking eight rounds to register. Three rounds each for the 60 and 81mm mortars were sufficient, while the cannon company was able to pin-point its target (a water tower) on the first round. At 1600, on 18 November the company was informed that a battalion of enemy was moving toward them, was on the lookout for them. A patrol was sent out by Lt. Bernasco in an endeavor to draw fire, but nothing was found or heard. After dark, when everybody had settled down for the night, the two heavy machine guns covering the crossroads at (028387) suddenly opened fire at about 1900. This caused the company to call for its protective fires at about 2000. The machine gunners saw the patrol, and held their fire until it advanced within a few yards, when they annihilated them. Total casualties for the company on 18 November were 1 killed and 17 wounded — again mostly from the artillery fire. 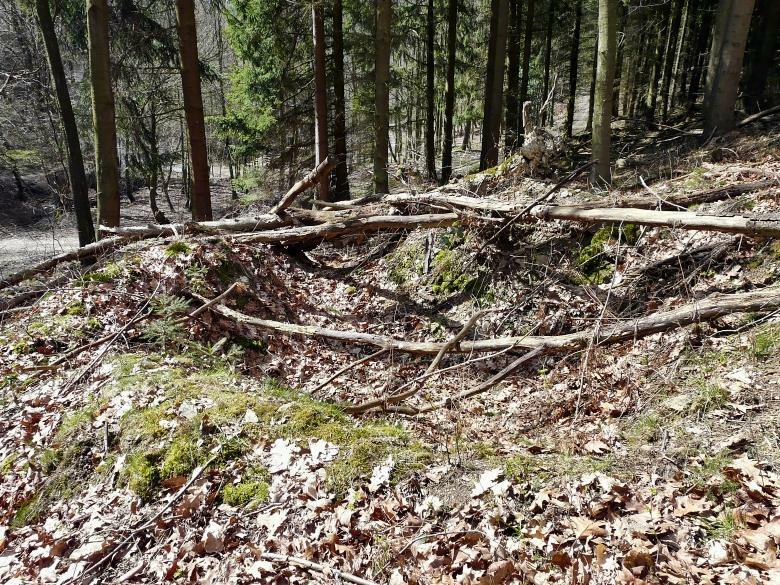 Remains of German dug-out overlooking the horseshoe turn. Concrete structure at the horseshoe turn. The company sector was quiet, and the troops remained in place. A Company did not participate in an attack, but made a fake firing demonstration, using all their weapons except bazookas. The platoons were echeloned to the left rear, with the 1st platoon on the right (south) flank. Therefore, the 1st platoon could fire straight to the front, while the other platoons were forced to fire up into the air. The 3d battalion then moved around the left flank of A Company; the fake attack worked so well that the 3d Battalion advanced without a great deal of difficulty. The object of the diversionary was to draw fire away from the 3d battalion, and it certainly accomplished this mission. “It all sounded O.K. until they started returning our fire,” said Lt. Bernasco. Very severe mortar and artillery ﬁre dropped on A Company’s positions, but they continued to stick their shelters and deliver additional diversionary fires to deceive the enemy. The 1st platoon, firing forward and making feints as though they were going to jump off on an attack, was hit the hardest by this fire. S/Sgt. Elvie Ingram, 1st platoon guide who had (according to his platoon leader, Lt. Bernasco) done an outstanding job in leadership and had personally accounted for at least three enemy with rifle grenade shots, was killed outright when a shell fragment struck him in the head as he was directing fire for the fake attack. Sgt. George Mahner was firing to the front when a tree was felled in front of his field of fire. Unable to continue his mission, Sgt. Mahner ran out to try and clear a place to fire. He had hardly left his hole when a tree burst killed him instantly. S/Sgt. Hopkins came over to Lt. Bernasco’s hole, and informed him that a shell had struck his hole and badly injured Pfc. William Delaney. Pfc. Delaney died before he could be evacuated. Total casualties in the 1st platoon alone were three killed, 8 wounded, and 1 battle fatigue — 61% or their effective strength at the start. Thanksgiving Day, the company remained in position behind the 3d battalion. A patrol was sent out to the 3d Battalion, and a portion of the company moved up to protect the left flank of the 3d Battalion. Enemy shelling continued, but not as heavily as during the fake attack on 22 November. Each platoon made a reconnaissance with the Executive Officer of Company I, to ascertain the positions which were to be occupied on 25 November. The company moved out on schedule at 0830 to take over the positions formerly occupied by I Company. Sniper fire and heavy mortar fire, with many ricochets along the enemy front, hampered the replacement. The 2d platoon froze from the mortar fire while crossing an open field before reaching the I Company positions, and the 2d and 3d platoons had to go around it. This move was part of a coordinated battalion move behind the attacking 2d and 3d battalions. A Company suffered few casualties in mopping up small pockets of enemy left behind by the attacking forces. At the close of the day a line of defense was established 200 yards west of the town of Grosshau. The move was made in column of platoons in the following order: 2d, 3d, 1st and weapons. One squad was on each side of the road and the third squad split in two so the move-up took the form of two columns in approach march. 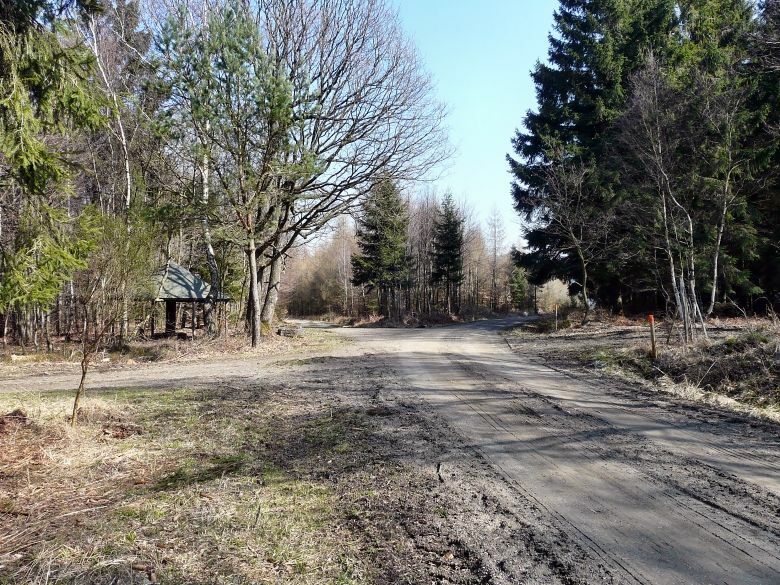 The advance was made up a firebreak, then south down a draw, where some casualties were suffered from the artillery fire; at (0595925) they crossed the road, and then tied in with I Company for the night, also tying in with C Company on A Company‘s right flank and rear. With 27 men, the company covered a front of approximately 300 yards. The company remained in the same position, and casualties were not unduly heavy. However, on 27 November one shell hit very close to the foxhole of Capt. William Q. Surratt, the company commander, and he had to be evacuated. Lt. Donald A. Warner took command of the company after the company commander had been evacuated. The company moved again — this time to take over the area of K Company. No casualties were suffered during the move. After the 2d Bn. had seized Grosshau, the 1st Bn. reverted to regimental reserve, and A Company moved to the black-top road running north-south into Grosshau. A Company was placed on the left flank of the battalion, with B Company in the center. The company moved across the black-top road and went into a defensive position at the outskirts of Grosshau on the northeastern edge of the village. A defense was established with A Company and one section or the 2d platoon of heavy machine guns of D Company on the left. A Company was the second in line of the three companies which crossed the open ground in the vicinity of (062387) and attacked enemy positions which were holding up the 2d Bn. east of Kleinhau. The plan was for A Company to attack across the open ground and then turn right (in the direction of Kleinhau) and clean out the enemy pockets which were holding up the 2d Bn.’s front to its east. A smoke screen was provided for C Company prior to crossing the open ground. According to the CO, Lt. Warner, and the men of A Company, this smoke screen had dissipated by the time A Company got ready to jump off. Furthermore, C Company had had the assistance of tanks, which were not designed to accompany A Company. A Company’s heaviest casualties were suffered in crossing the open field in a southeasterly direction. The field was about 500 yards in width and the first and third platoons advanced abreast, with the second platoon in support. A line of skirmishers was established across the field, 400-600 yards wide, in a continuous line. The enemy had excellent observation from the Gey area and also from the woods into which the 1st battalion was advancing, and was able to place accurate mort ar and artillery fire on the advancing troops. “Every step you’d take there’d be a shell to help you along,” said Pfc. Arthur A. Bonaldo. Three tank destroyers were supporting the attack, firing generally in a northeasterly direction from the point before the company crossed the open ground. At (061385) the enemy had emplaced a towed 88mm gun, which was later knocked out and found at that spot. This 88mm gun was delivering direct fire on the advancing troops; direct fire was also coming from the northeast edge of the woods, delivered on the open space across which the troops were advancing. Since the entire weapons platoon had been wiped out prior to the start of the attack, it was impossible to use any mortars or machine guns in support. BARs were distributed as liberally as possible on the flanks, but for the most part the company had to rely on the standard M1s for the bulk of their firepower. The advance continued in a skirmish line, which was unbroken despite heavy enemy fire. “C Company had apparently barreled through the wooded area without too much trouble, but they stirred up the commotion which greeted us,” Lt. Warner states. That day, A Company suffered 65% casualties, 20% of which were killed, and at the close of the day dug in with 35 men. These 35 men were given the mission of holding the left flank of the battalion at all costs; six of these men were then attached to B Company to help strengthen the lines and to maintain contact. The remaining men repulsed several enemy attempts to infiltrate into the battalion’s left flank. (1) See account of B Company for the way these A Company men assisted in repelling the counterattack. At the close of the day’s fighting on 3 December, A Company had 20 men left, plus the company commander, Lt. Warner. Six of these men had started the forest campaign on 16 November; the remainder had been killed, wounded, or captured. Included among the killed and wounded were eight platoon leaders. During the final three days of the campaign Pfc. Arthur A. Bonaldo led the 1st platoon, while Pfc. John L. Page was the platoon leader of the 2d platoon. All of the platoon leaders among the officers had been killed or captured, and there were insufficient officer replacements to fill the vacancies. During the campaign, water shortages became more serious as the days progressed. “We had plenty of rats, food and ammunition, but never enough water,” said one of the boys. At one point toward the end of the campaign, the men of A Company went for three days without water. “We put raincoats over our holes and tried to catch some of the rain and sleet,” said Pfc. Fern L. Hartman, “but inevitably a shell would come along and splash some mud into what we had carefully collected.” Much of the water supply early in the campaign was obtained from the north-south stream which paralleled the north-south road. Thereafter, it was a question of finding small streams or springs which could be utilized to fill canteens and hand-carry to the front line troops.